The WWE is reporting the Wrestlemania 28 has set a record in terms of pay per view buys and the live crowd attendance at Sun Life Stadium in Miami. 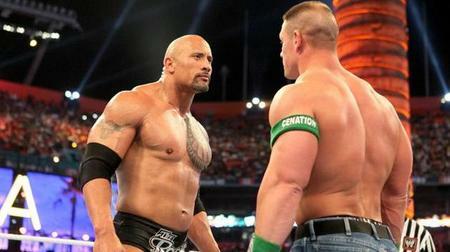 There were 1.3 million PPV buys world wide, meaning more than five million fans watched the Rock vs. John Cena. 78,363 fans from all 50 states and 36 countries were live in attendance that day. What conclusions can be made here? Should the Rock get the praise for the higher buy rate? Did fans from the Attitude Era come back as the Rock made his return? While the numbers sound good on paper, it's not been reflective on the subsequent episodes of Raw. Ratings are still down. Even for the shows the Rock appeared on. But Survivor Series 2011, which truly marked the Rock's return to the ring pulled in 281,000 PPV buys, which was significantly up from 2010's event of 244,000. I think it would be foolish to not credit the Rock for at least some of the increases in buys. But can one person be credited completely for the popularity of Wrestlemania? I was skeptical about the Rock going over Cena at the event. I still don't agree with it, but I'm assuming there is still some kind of bigger picture thing we're still waiting to see pan out. I wonder with the success of the Rock's return (in PPVs buys) will the WWE continue to bring back stars from wrestling's boom period? Of course time is not on the company's side, as the Rock may be one of the few guys who is still in as good of shape (if not better) than he was 12 years ago. So while the WWE touted it as the end of an era at Wrestlemania, I have trouble believing that will so many buys we won't see more of that "era" at future events. Your thoughts? Post them here or on our Facebook wall.